Hurricane Dennis started as a tropical wave that Mark and I were watching when it left the west coast of Africa. We knew that it was way to early for any deep tropical development this early in the season. However, it has happened as recently as 1996 with Hurricane Bertha which developed from a true Cape Verde wave and hit the North Carolina coast in early July. As of 11pm on July 4th, 9 years to the day that Bertha developed, tropical depression 4 had the first advisory written on it. Just twelve hours later Tropical Depression 4 became Tropical Storm Dennis. 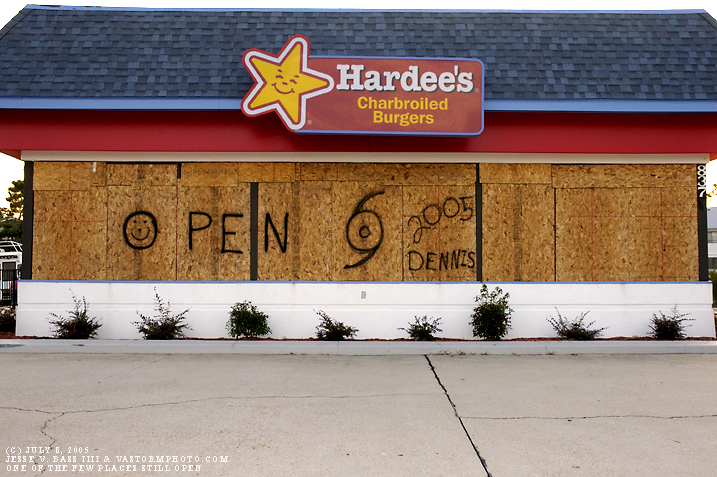 By Wednesday July 6th, Dennis was upgraded to a hurricane. The NHC was thinking that it would be a hurricane as of the 5pm advisory, however, the Hurricane Hunter Aircraft was on their way to investigate and once into the center, they found that in fact Dennis was a hurricane with winds near 80mph. Dennis would then continue to strengthen as he moved off to the west-northwest toward Cuba and Jamaica. By the time the 5pm advisory was written on the seventh, Dennis had become a major hurricane with winds now at 115mph and a minimum central pressure down around 957mb. This would set a record for the earliest known category 3 or higher hurricane before July 15th. Just a few hours later, Dennis would reach category 4 status with winds near 135mph. By early morning on the eighth, Dennis would be making landfall along the Cuban coast as a strong category 4 hurricane with winds now near 150mph. Dennis would spend the rest of the day over the island of Cuba which would have a real effect on the structure and intensity of Dennis. Once the hurricane moved back into the Gulf Of Mexico, Dennis was expected to re-strengthen before hitting the U.S. Gulf Coast. The battle with Cuba really took it's toll on Dennis and it would be awhile before the intensification process would get under way. By late in the day and early evening of Saturday July 9th, Dennis was well on his way to becoming a major category 4 hurricane once again in the Gulf. By 5pm, the forecaster on duty noted "What a difference 6 hours makes!" Dennis had started a rapid deepening phase with the pressure dropping 10mbs in just six hours. By 7pm, the next forecaster on duty notes "What a difference 2 hours makes!" In just as little as an hour and a half, the pressure dropped another 11mbs. The next advisory stated that it appeared that Dennis had finally leveled off in strengthening and the forecaster referred to it as "bordering on the insane!" This really opened a few eyes in the area as the forecast started looking like Mobile Bay or Gulf Shores, Alabama. And Gulf Shores is just where Mark and I were. 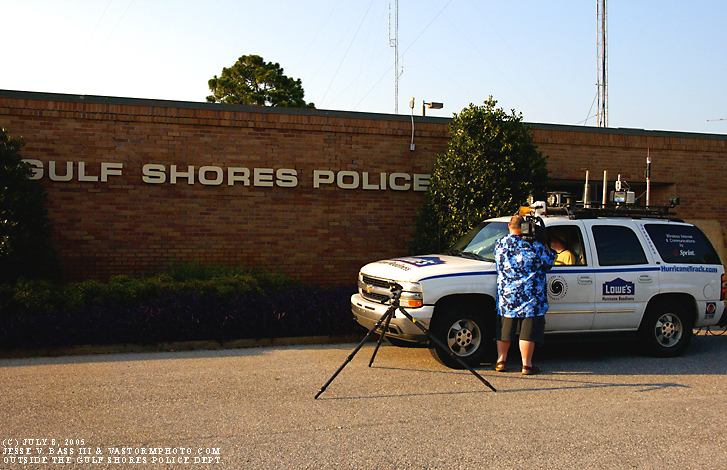 We stayed at the Gulf Shores Police Department overnight Saturday which is where H.I.R.T. was last year for Ivan. However, during the week I had started to catch a cold or the flu. Feeling horrible, I turned in for the night in our jail cell set aside just for us to try and rest. By morning, I had really gotten ill and was just unable to help Mark with the new H.L.P. windtower. By 6am on Sunday the tenth, the E.O.C. 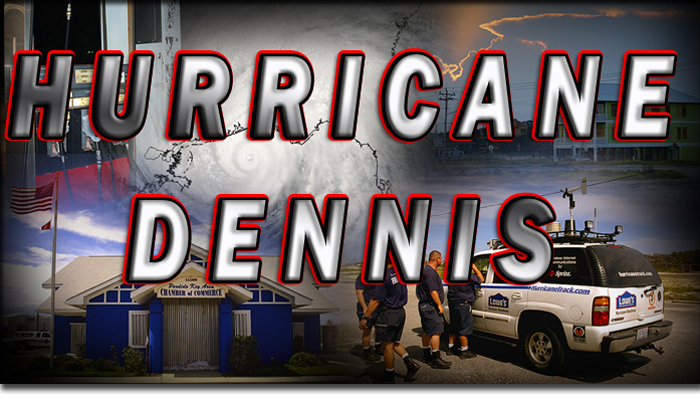 office in Gulf Shores told the folks at the police department to evacuate the station for fear that Dennis could reach cat.5 status or if it had come ashore over Mobile Bay, the storm surge in Gulf Shores could have easily surpassed Ivan's surge. I left with the police and we went to the Public Works building just north of the bridge that leads to Gulf Shores. As the day progressed, Dennis began to turn northwest and then north-northwest. Mark set up in Perdido Key, Florida with the tower. Dennis would eventually come ashore near Navarre Beach, Florida. The highest wind on the tower was a 52mph gust. The entire west side of the storm had basically collapsed. The folks in Mobile, Gulf Shores and even Pensacola sighed a huge sigh of relief. Even though Dennis went well west of us, it was great to meet the great guys and gals of the Gulf Shores Police Dept. Also, Mark and I met the guys of Engine 19, the Perdido Key Fire Dept. This would be the area where Mark would set up the H.L.P. windtower for Dennis. Just a fabulous group of people to meet and work with during a hurricane. 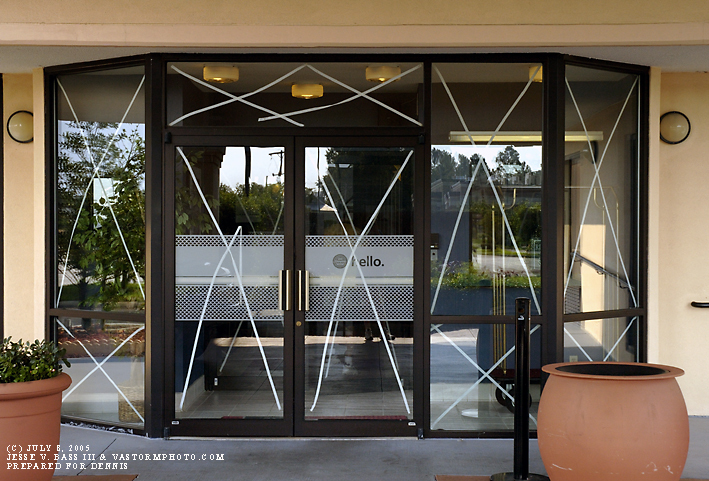 We look forward to working with them again, however, they would rather not see us again for some time. 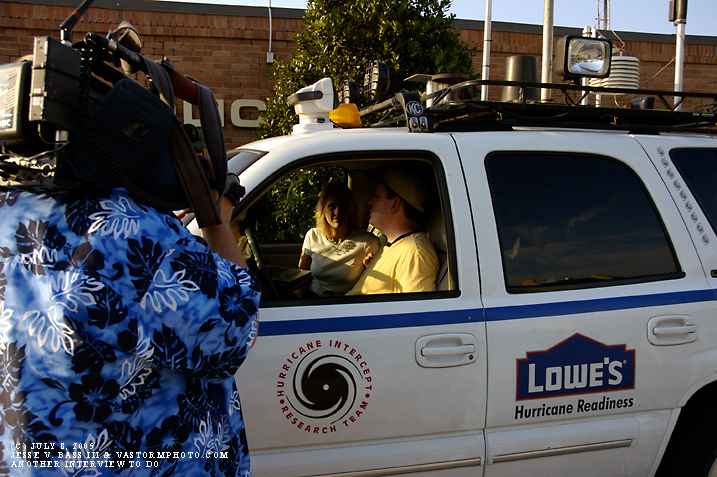 Below are some of the photos taken during the days leading up to and the day of landfall of Hurricane Dennis. Mark Sudduth and I arrived in Mobile in the early morning hours of July 8. 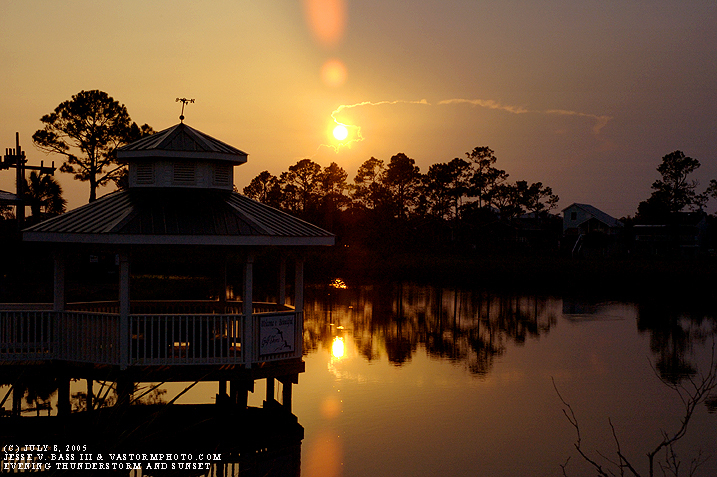 We got some much needed rest as I was battling a bad cold and then in the afternoon hours headed for Gulf Shores. 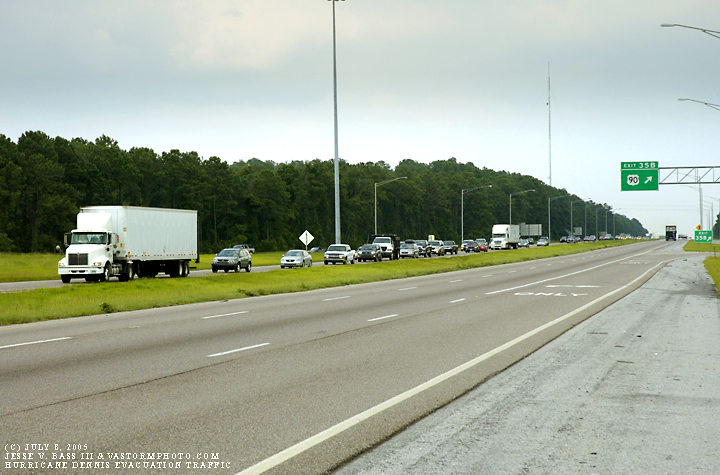 This photo was taken along I-10 looking at westbound evacuation traffic leaving the coastal areas to the east. This shot is on the eastern side of Mobile Bay along I-10 looking back to the west. 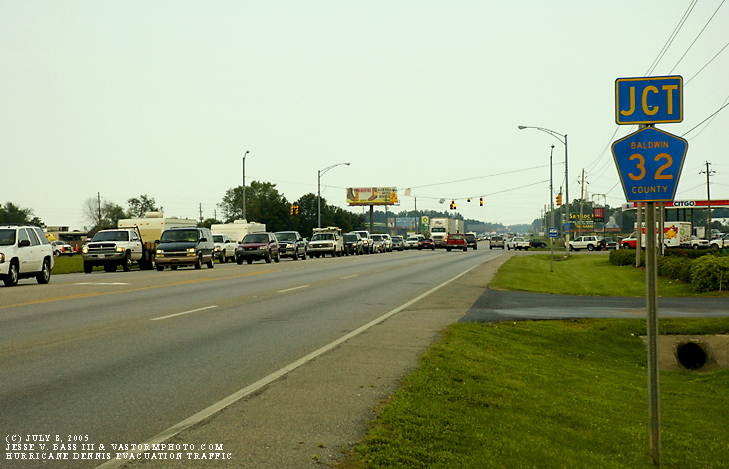 Traffic was coming to a stop as it continued to back up quickly. Once Mark and I hit Rt. 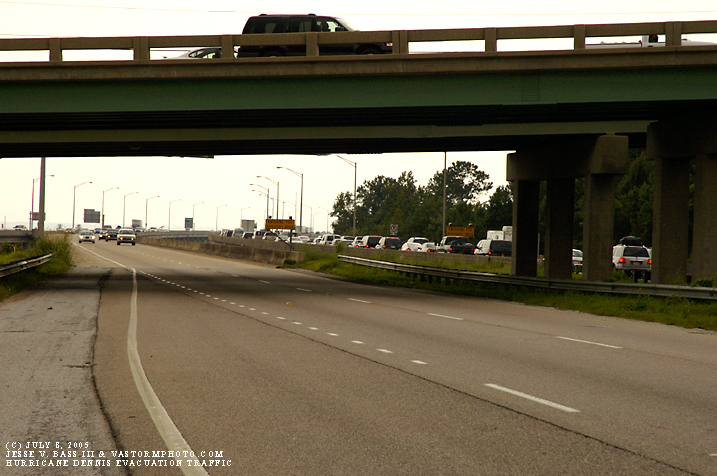 59 just north of Foley, Alabama, the northbound lane was congested with evacuation traffic of folks fleeing the coastal areas in Gulf Shores for higher, safer ground. This was becoming an all to familiar sight through Alabama. 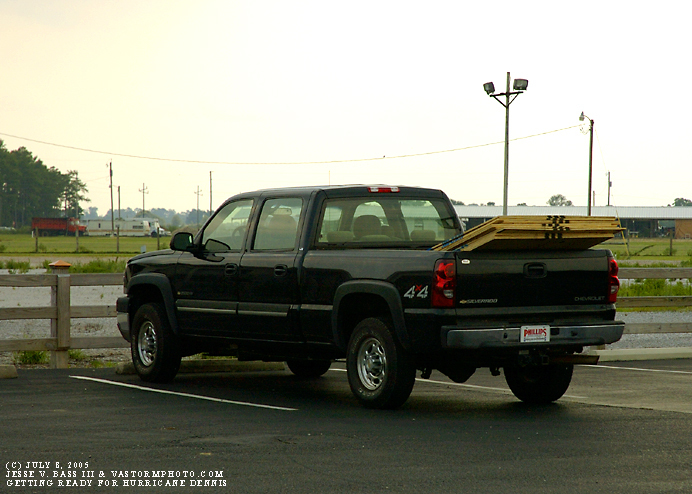 We saw plenty of vehicles loaded with plywood for boarding up their homes and businesses. 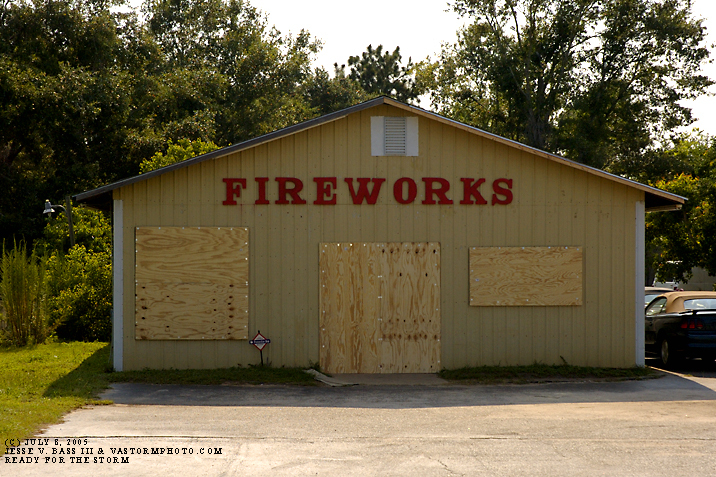 Boarded up and ready for whatever Dennis threw at them, this fireworks store was ready for just that, the fireworks of Mother Nature's fury. Once in Foley, the lines at the pumps were long and people were quickly filling cars, trucks and extra gas cans for their possible drive out of town, or for getting around after the storm had passed. With 40 gallons, this guy was ready! We arrived at our hotel, the Hampton Inn in Foley, to find that some attempt had been made to prepare for Dennis. Unfortunately, this little bit of tape is not going to do much with winds near 120-145mph. With that being said, the folks here were just awesome. Just a great bunch of people who were very hospitable and interested in what we were doing. We were not in town long before the interviews started. 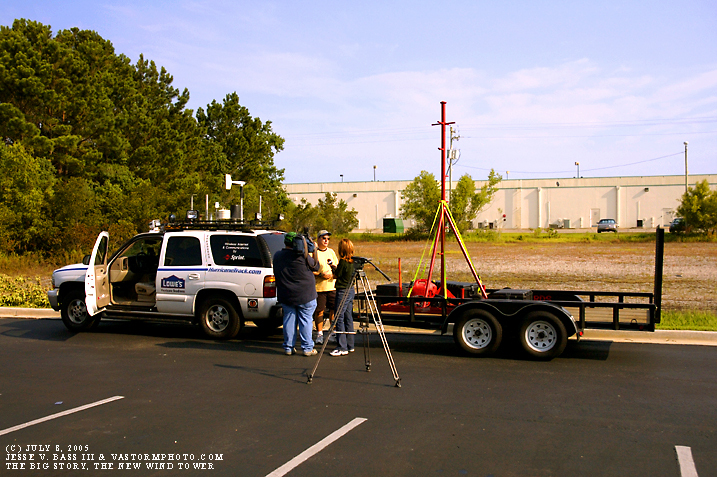 They were tracking us down at the hotel to see the truck, the new windtower, and to get Marks take on Hurricane Dennis. The new wind tower was quickly becoming the big news story. We drove south after checking in at the hotel to the Gulf Shores Police Dept. 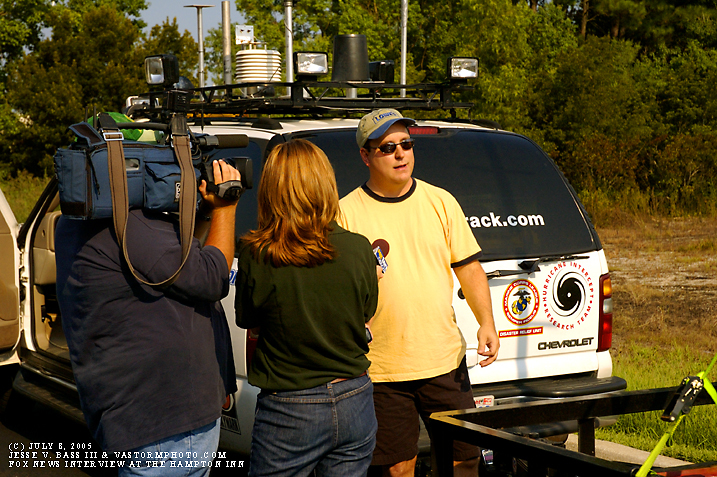 Here another TV crew caught up with us at the station to do another interview. 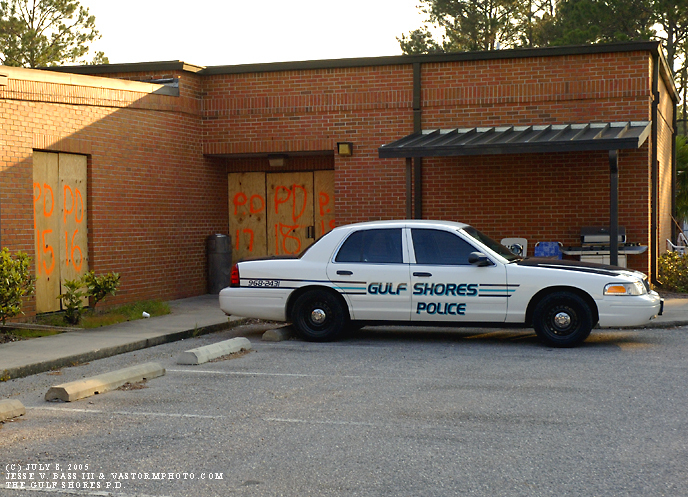 The Gulf Shores Police Dept. would be our home for at least on night while we were preparing for Dennis. We would stay here in a jail cell over night on Saturday. After chatting with some of the folks at the PD. 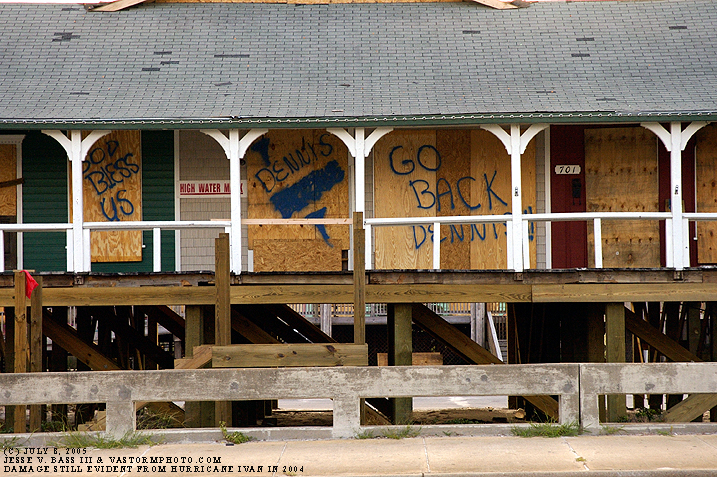 we headed out to shoot a few photos and video of the area all boarded up for Dennis. Messages to Dennis. As you can see, there is still some damage to the roof from Hurricane Ivan last September. As I was shooting some of the area, I noticed to the west-northwest there was a big thunderstorm in the distance with the setting sun peaking out from behind the storms. 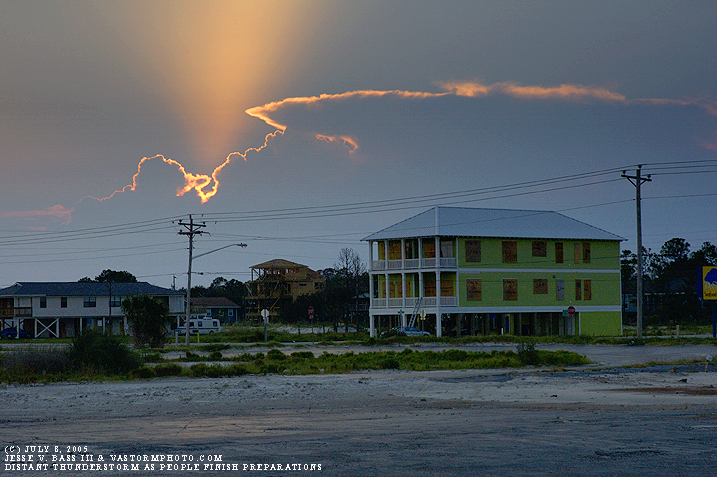 Moments later, we reached the beachfront to see this beautiful sunset and the same storm. Contrast this beautiful scene with the folks in the foreground making final preparations to their home for Dennis to arrive on Sunday. This was as I said earlier, an all to familiar scene. 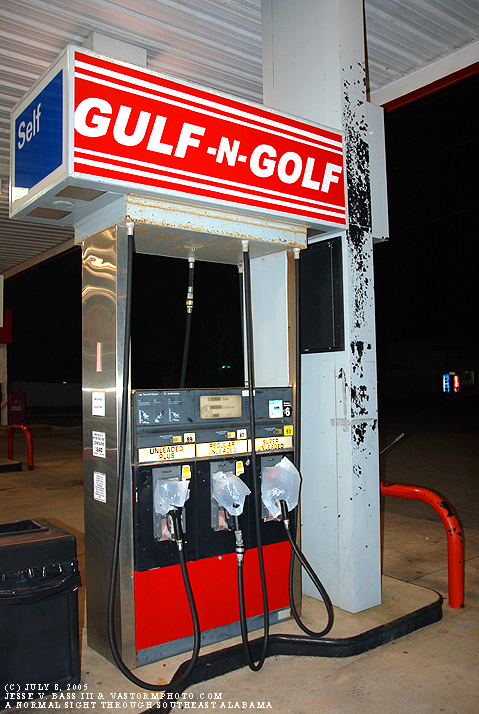 every gas station in town, from Gulf Shores to Foley was without gas. 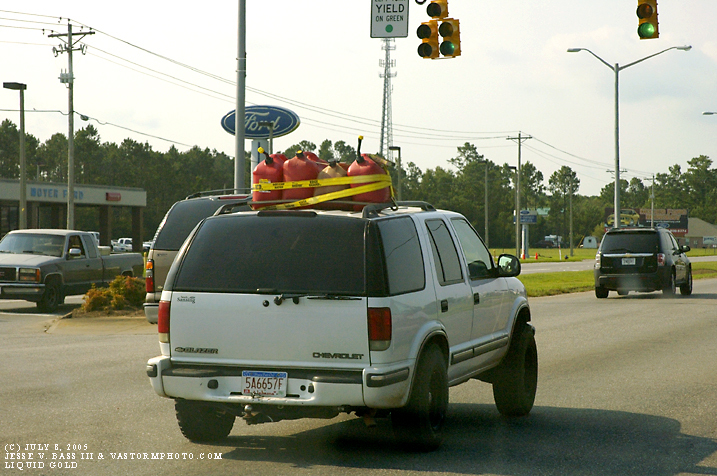 Bags on the pumps are something you just don't want to see as a major hurricane approaches. We headed further up the road to top off and meet Jeff Flock and Rob Hess formally of CNN, who now have their own hurricane news website HurricaneNow.com. They followed us back to the hotel and checked in. They would come sit and chat with Mark and I awhile as we were uploading video and working on photos to be posted to the websites and to Weather.com. We would get some good rest over night as Dennis closed in on the Gulf Coast.